Girls Made of Snow and Glass by Melissa Bashardoust is the 2017 Young Readers Porter Square Book of the Year, and will be 20% off for the rest of the year! Bookseller and three-time Book of the Year champion Rebecca, who nominated Girls Made of Snow and Glass for the award, got the chance to interview Melissa Bashardoust for our blog. PSB: Girls Made of Snow and Glass was released to a lot of acclaim – several starred reviews and “most anticipated” lists, not to mention it won PSB’s Book of the Year competition! What’s the coolest/most unusual thing that happened during your debut experience? MB: First of all, I am so honored to be a PSB Book of the Year—thank you so much! Doing an interview with NPR with Lulu Garcia-Navarro was a huge, scary, cool experience—I was so unsure of what to expect, but was ultimately grateful for the experience. Other than that, there are two things about the debut experience that I never knew I would love so much: 1) seeing photos of my book with people’s pets and 2) people telling me my book made them cry in public. I’m delighted every time. PSB: Tell us about your path to publishing Girls Made of Snow and Glass. Was it the first novel you completed? MB: Girls Made of Snow and Glass was my second completed novel. I put my first novel aside after querying it unsuccessfully for about a year and worked on a completely separate project for a while before the idea for GMOSAG first crept into my brain. I started writing it as a low-pressure side project and then realized I wanted to write it more than anything else at that moment, so committed myself to it fully. After that, I revised it, queried it, revised it more, signed with an agent, revised it more, got the book deal, revised it more, and now it’s a real live book! Which just goes to show you how important it is to keep writing and revising and never give up. PSB: Girls Made of Snow and Glass is a gorgeous fairy tale retelling (our catnip!). How did you decide to incorporate or change elements of the original tale? MB: What draws me to retelling fairy tales is the chance to dig into the themes of the original stories using a familiar/recognizable framework. Fairy tales give you the bones, but they also give you a lot of freedom when it comes to character motivations and relationships. For Snow White, I wanted to explore the intersections of women/power/beauty and the roots of female rivalry. Originally, the story adhered more closely to the fairy tale’s plot, but as time went on and the characters developed their own stories, I realized that as long as those themes were in place, it was still Snow White, even without the apple. All the trappings—the magic mirrors and poisoned apples and glass coffins—are wonderful aesthetically or symbolically. But they can be adjusted or cut out without removing the core of the story that I really wanted to focus on: the fraught relationship between a girl and her stepmother. PSB: One of the relationships that stands out is Lynet’s romance with Nadia. It’s so wonderful to see positive queer representation in young adult fantasy. How did their relationship develop over the course of writing the book? MB: So, fun fact about Nadia: she was originally a male character. I had endless struggles writing that character and figuring out his motivations, and his relationship with Lynet felt very forced because I felt like I needed a romance but I wasn’t necessarily invested in it, in part because fairy tale princes have never been a point of interest to me. After every round of revision, my editor would ask me hard questions about the character’s motivations and I would try to approach the character from a different angle, trying to figure out how to make him work and feel like an integral part of the story, and it was only when I tried making the character female that everything clicked together. Nadia made sense to me as a character, and her relationship with Lynet enriched both Lynet’s arc of self-discovery and the themes of female relationships in the novel. And of course, it’s so vital for everyone—but for young people, especially—to see themselves represented in fiction, and knowing that made this relationship feel important and necessary in a way that it hadn’t before. PSB: I really loved the antagonistic relationship between Mina and Lynet, and the different ways they wield power in a traditionally male-dominated world. What went into the making of their characters and relationship? MB: That relationship was always the heart of the story for me. I really wanted to explore two of my favorite archetypes—the evil queen and the innocent maiden/ingénue. These are two kinds of women we see in fiction who are often pitted against each other, both in the narrative and by society, as if one has to be the “wrong” kind of woman in order for the other to prevail. I’ve always found that rivalry frustrating since I love and find inspiration and strength in both kinds of characters. Mina and Lynet seem diametrically opposed on the surface, but I wanted to highlight their parallels and the ways they are uniquely situated to understand each other, because they’re really just on different points of each other’s timelines. In their relationships with their fathers, too, I wanted to look at two different ways women are unfairly treated by male-dominated society—the struggles of being devalued as well as the pressure of being put on a pedestal. Both are dehumanizing in their own ways, and so both characters learn to cope differently. PSB: I can’t wait to reread Girls Made of Snow and Glass on a cold day with some hot chocolate. Are you working on anything new that readers can look forward to? MB: Yes! I’m working on another YA fantasy right now that draws from Sleeping Beauty, Rappaccini’s Daughter, and Persian mythology. This one is set during spring for a change of pace. PSB: Thank you so much for taking the time for this interview. 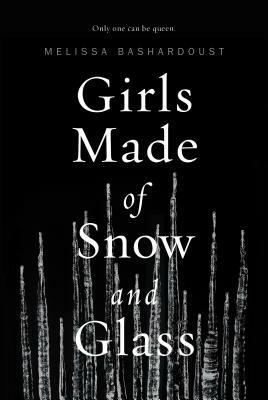 Last question: Are there any books you’d like to recommend to satisfied readers of Girls Made of Snow and Glass? MB: Thank you for having me! For other character-driven, feminist/female-centric spins on fairy tales, I’d go with Betsy Cornwell’s Mechanica, Rhiannon Thomas’s A Wicked Thing, or Malinda Lo’s Ash. For fairy tale retellings that explore other points of view than just the hero’s, Donna Jo Napoli’s retellings—Zel and Spinners among others—were hugely influential for me. For a book that mixes fairy tales with complicated mother/daughter relationships, check out Melissa Albert’s The Hazel Wood.